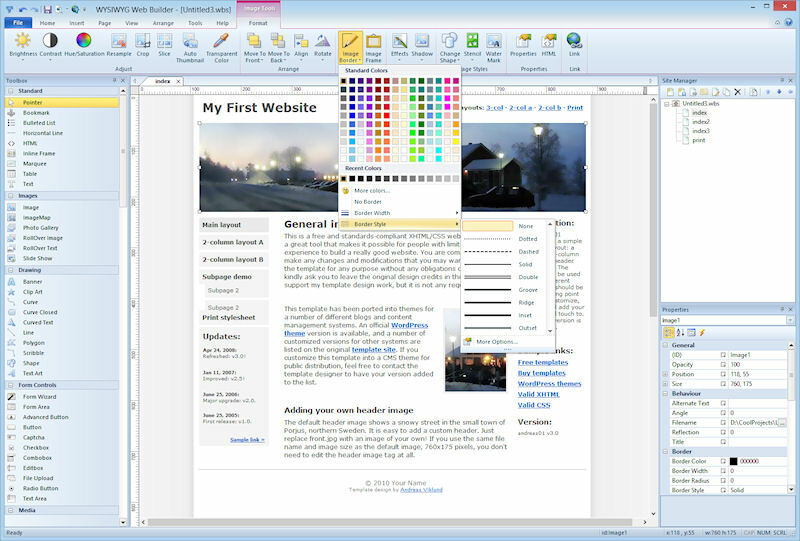 WYSIWYG Web Builder is an all-in-one software solution that can be used to create complete web sites. unlike fluid (dynamic) layouts (generated by traditional HTML editors) where the position of objects depends on the position and size of the objects surrounding it. WYSIWYG Web Builder generates HTML (Hypertext Markup Language), HTML5 or XHTML tags while you point and click on desired functions; you can create a web page without learning HTML. Just drag and drop objects to the page position them 'anywhere' you want and when you're finished publish it to your web server (using the build in Publish tool). The software gives you full control over the content and layout of your web pages . Drag and drop of the HTML objects: Text, Lines, Images, Marquees and Tables. Customizable menus, toolbars, keyboard accelerators, dockable windows, tabs, autohide windows. Powerful Form tools with built-in PHP form processor. Password protect your pages with the Login Tools/User Management. Option to add custom HTML for each object (Before Tag, Inside Tag, After Tag). YouTube, Java, Flash, HTML 5 Audio/Video Quicktime and other Plug-In support. Publish your entire web site, a single page or a group of pages (to local drive or a web/ftp server). Navigation bar, Slide menu, Mega Menu and many other navigation tools. Support for third-party add-ons, using the Extension Builder tool. jQuery UI Widgets: TAbs. Accodrion, Date Picker, Dialog etc. Shapes, TextArt and other drawing components.